A recessed (weak) chin is analyzed in three dimensions. From AP (front) view, the chin is evaluated for horizontal width and vertical length. A chin deficient in these two dimensions will appear like a small ball without much distance separating it from the lower lip. In contrast, oversized horizontal and vertical proportions are synonymous with very strong male jaws epitomized by the cartoon character Dudly Do-Right. A weak chin is most commonly evaluated on profile view. Surgeons use multiple fancy methods to determine the ideal chin projection, correlating it to the forehead, nose, cheeks and neck. I find the easiest way is to drop a line from the lower lip, where the red lip meets the skin. 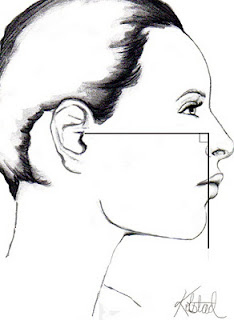 For women, the chin should reach this line or be slightly behind it (see figure 1). That being said, Angelina Jolie’s chin extends well beyond this imaginary line contributing to her fabulous neck contours. 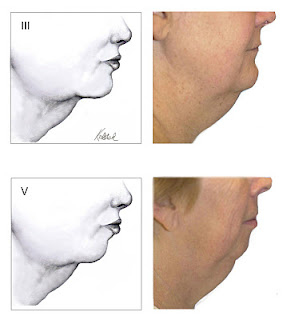 A weak chin can lead to an obtuse neck line (see figure 2). In my opinion this is only a marginal difference. A person would be better served by losing weight or liposuction than by getting a chin implant. If you have questions about chin implant surgery, please contact Kolstad Facial Plastic Surgery to schedule a consultation with Dr. Kolstad. You may call our office at 858.859.2563 to schedule your appointment today. We are conveniently located in in La Jolla between I5 and I 805. We serve men and women in La Jolla, Del Mar, San Diego, Rancho Santa Fe, Solano Beach, Encinitas and Southern California.